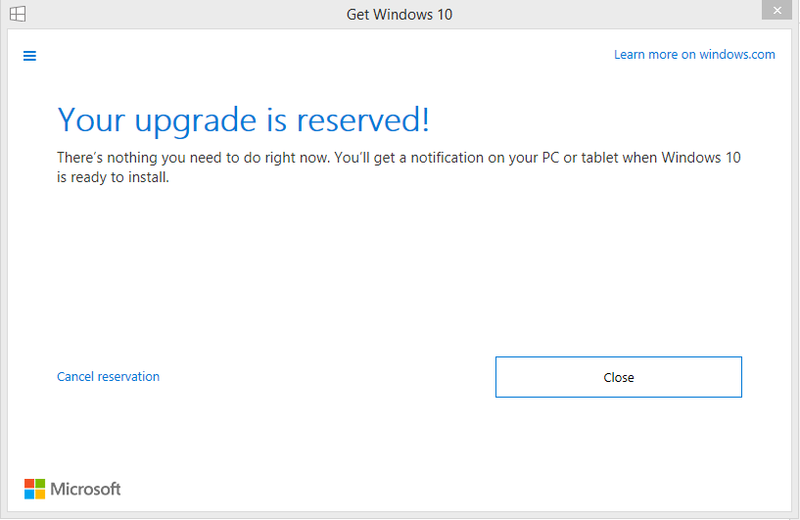 How to Reserve Your Copy of Windows 10 ? Windows 10 is set to release on 29th July 2015 and allowing existing customers to book their copy in advance. 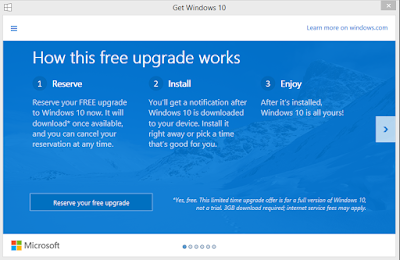 Please note that Windows 10 is available for free if you’re already using Windows 8/8.1, Windows 7. How to reserve Windows 10? Make sure that you’ve installed all the updates available for your PC. If you haven’t done that already, do it now. Press Windows button and ‘Q’ already and type ‘Update’. Click on ‘Check for updates’ from the listed search results. Follow on screen steps to install all the available update. Restart your PC after installing all the update. 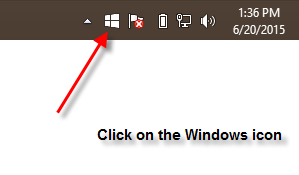 After that, keep your spy on lower right side of the screen at the task bar and see there is a ‘windows icon’ will be listed. Click on ‘Reserve your free upgrade’ and type in your email Id (preferably you’ve used to sign in to your Windows 8/8.1 PC). 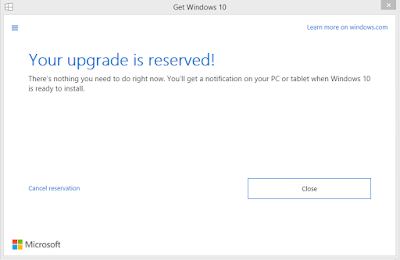 You’ll also see a confirmation window stating that your copy is registered and will receive notifications once the update is ready or Windows 10 is launched. To read more about Windows 10, head to installation manual. Share your feedback or comment about this upcoming Windows 10!! Putting your business online and make it appear in front of targeted eyeballs has become more challenging than ever. Your online business name (website URL) is the first thing that appears in front of your targeted customers and choosing it wisely is half the battle already won. You may find the desired domain name has been already registered or not available. To get one, you might need to invest huge amounts of money to acquire it as bidding is generally high on popular or expired names. Don’t panic and have a look at unique service offered by BrandBucket, which already helped millions of users over web in getting the brandable company names for user’s product or service. BrandBucket does its own research to find the best matching top level domain(TLD) names for the products or services you are about to offer. By opening BrandBucket.com website, you’re able to see search text bar right in front of your screen. Just enter your desired business name or keyword (related to your product or service) and this online marketplace will discover the best suited names for you. For example, I’ve entered ‘Shoes’ as my business keyword in the search text bar and it’ll populate the list of available names matching to my business theme. You can go with the desired business name that comes under your budget and you are good to go. That’s how it all works!! You can also make use of the menu bar located at the top left corner to filter your search results or search for specific names that falls under your budget. For example, set your targeted budget, sort by date, prices or alphabetically etc. 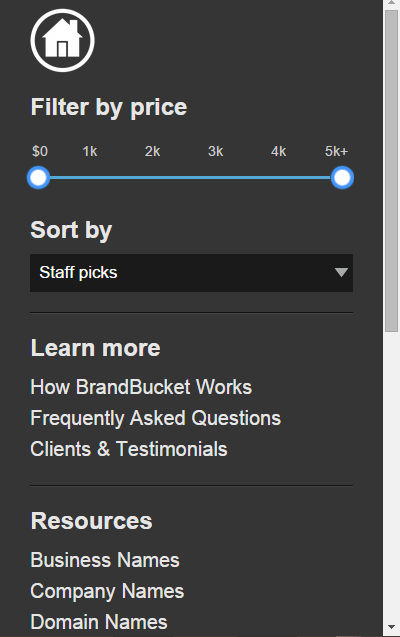 You can further categorize the search results by their own staff picks. Your business name is the first thing that your targeted customers would see. Choosing it wisely has an adverse impact and may become the deciding factor on doing business with your company. When you choose BrandBucket, you’ll get a list of astonishing .com domains that definitely attract customer eyeballs and a logo that is ready to use for your business. BrandBucket has thousands of satisfied customers who believe that their money is well spent. Still not satisfied?? Read out the whole story here and why you may miss the money on the table.